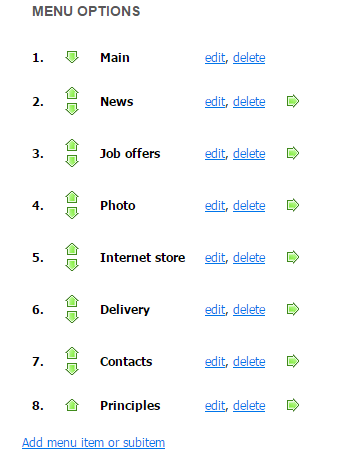 In the upper menu of the website management system, go to "Design" - "Menu options". 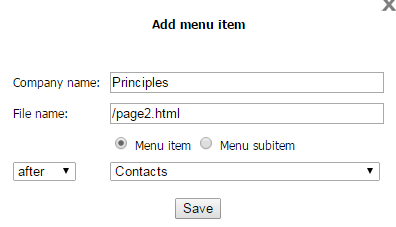 To add a website page as a menu item or subitem, use the "Add menu item or subitem" hyperlink. 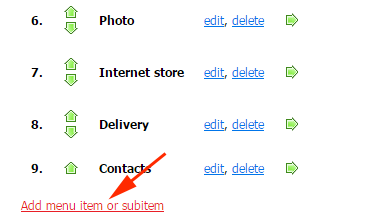 Go to the page that you wish to add to the menu or submenu, and click on the "Add to menu" hyperlink. You can move an item up or down using the green arrows accordingly. 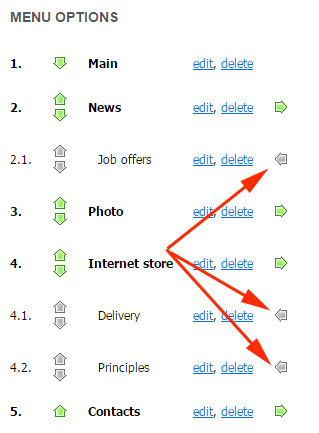 By clicking the horizontal green right arrow you can turn the menu item into a subitem. 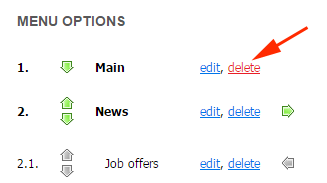 By clicking the horizontal grey left arrow you can turn the subitem into menu item. 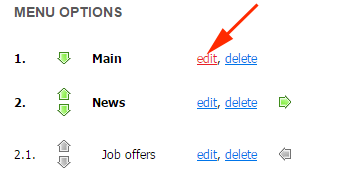 Click on the "edit" hyperlink opposite the necessary menu item/subitem. 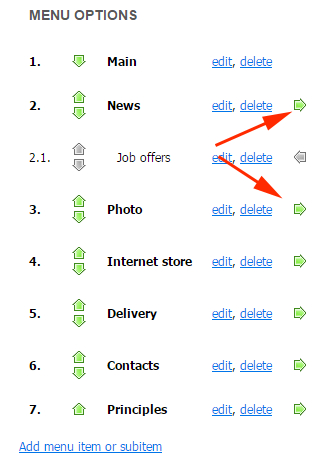 Click on the "delete" hyperlink opposite the necessary menu item/subitem. 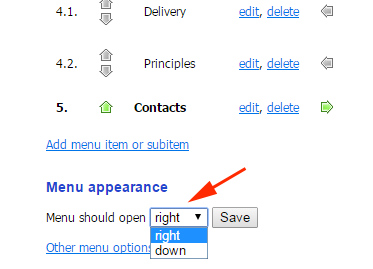 In standard design you can change the menu subitem dropdown style: "down" or "right". Attention! This setting does not work with custom designs and design templates. 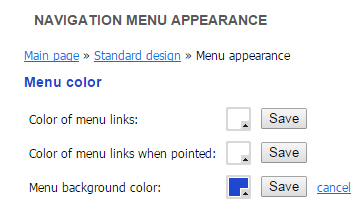 In standard design you can change the menu hyperlink color and background color. When using your custom designs or design templates, the appearance of your menu will also be customized. 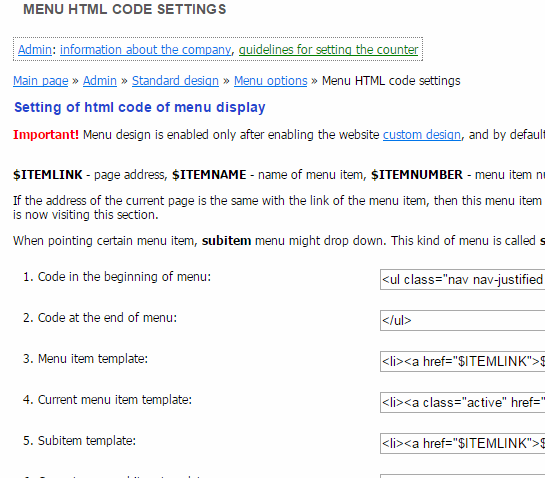 You can set up the HTML-code for your customized menu on this page: "Design" - "Menu options" - "Other menu options" - "Menu HTML code settings". Attention! This setting does not work with standard design. 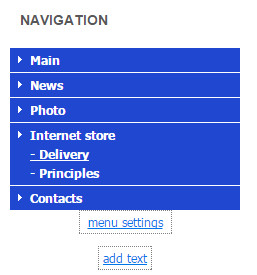 Customized menu HTML-code is applied to the menu only when the page design is customized.